Designed by Natalie Sun, the Color Cube Clock has a rubberized textured surface. 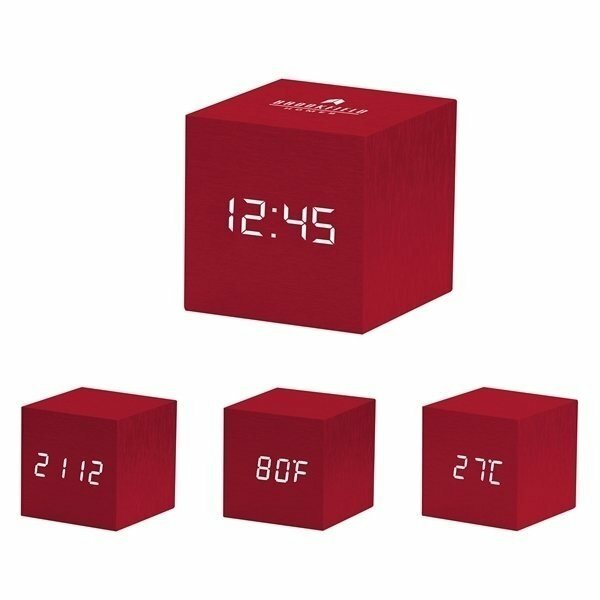 Snap your fingers or tap the cube and the LED display reveals the time, date and temperature and after a few seconds the display disappears. Complete with alarm, 5 minute snooze and an automatic dimmer. Works with 3 AAA batteries (not included) or a USB adapter (included). MoMA logo debossed on top. Proceeds from the sale of this MoMA product support the Museum programs. I think it is beautiful, I liked that. Great quality. the color that the product offered was the best about the product. I would have preferred being able to order a smaller quantity but understand that minimum order quantities have to be set for production efficiency. Fantastic quality. Great job. For this, I must actually say thank you these are so cute. My sixth graders were excited to see them and give them to the staff at our school. I liked the teal coor a lot. Great value for our money It looks great, but we shall see. For Teacher Appreciation Week, we ordered the products. The teachers LOVED them. This will be something we will order every year.